The Moto 360 (2014) was arguably the first truly stylish Android Wear smartwatch and it was followed up by the even better looking and far faster performing Moto 360 (2015). Both watches secured four star reviews from us, but now that we're deep into 2016, they're both old news, with increasingly stiff competition from rivals like the Samsung Gear S2, while the Apple Watch 2 sits intimidatingly on the horizon. So we're looking forward to the Moto 360 3rd gen and hoping it's up to the challenges it will have to face. So far nothing is known about it, but we're almost certain it's coming, given the warm reception the last two got. We'll bring you all the news, rumors and updates as we hear them, so keep this page bookmarked, but for now there are a few things we can speculate about, and far more that we hope for. The last two Moto 360 models each got a September launch, so the smart money is on a September announcement for the new Moto 360 as well, though there aren't yet any rumors that point to when we'll see it. 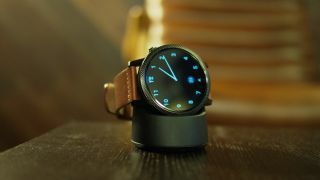 So far, the Moto 360 3rd gen has managed to remain shrouded in mystery, which is quite an achievement, given how much the Apple Watch 2 and most other high profile tech in the wearables sector has leaked. But there are some things we can make some solid guesses on. For one, there's a good chance that it will be powered by the Snapdragon Wear 2100 processor. This chipset has been designed specifically for wearables and it's both 30% smaller and 25% less power hungry than the Snapdragon 400 found in the Moto 360 (2015), which means it should hopefully make the upcoming Moto 360 longer lasting and potentially slimmer and lighter. The Moto 360 3rd gen is also bound to run Android Wear 2.0, which brings improved watch faces with widget support, better messaging and improved fitness tracking, along with support for standalone access to Bluetooth, Wi-Fi and cellular data, so our wearables are less reliant on a phone. We wouldn't expect the design will change much, as Motorola is already on to a winner there, but hopefully the Moto 360 3rd gen won't have the flat tire that's plagued the last two models and it may well get slimmer, especially if it does use the Snapdragon Wear 2100.